The other day while walking on the Miami, Wabash and Erie Canal towpath I saw three hovercrafts coming up the Maumee River. Eight hovercrafts from Indiana, Kentucky, Michigan and Ohio explored the Maumee July 21@22. The club members first went from Waterville to Grand Rapids. Got out at Grand Rapids. The next day they put in at the Mary Jane Thurston State Park boat ramp and sped up the Maumee to Napoleon's Ritter Park boat ramp. eight months to build his hovercraft. Just drive your hovercraft up the ramp when want to go on land. 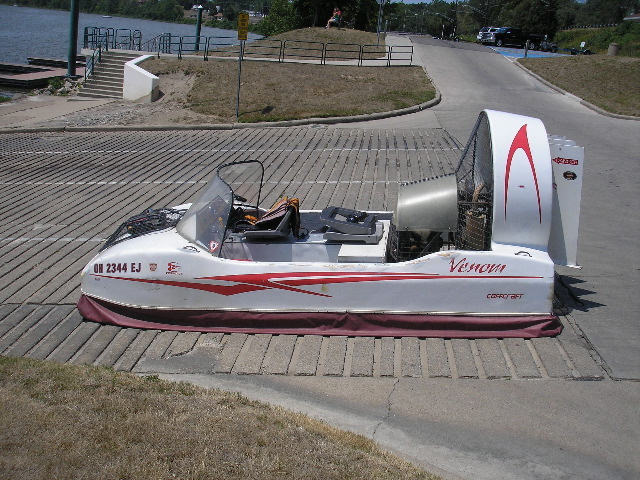 This hovercraft is owned by Steve Wilkins of Celina Ohio. Other members, Dave and Mary Ann Alexander of Temperance Michigan, said this years Hoverally 2012 is being held at Vincennes, Indiana Friday August 31st through Sunday September 2nd. of their lives while Mom and Dad look on. Article and photos submitted by Bob Morrison.